Keep taking your home practice further with the Advanced Course – an extensive and growing collection of advanced online Iyengar yoga classes. A brand new class is added to the program every week, which means you can always find new areas to explore. Challenge yourself to complete all of the classes and feel your practice grow. Do as many different classes as possible to ensure that you keep your practice balanced and expanding in all directions. Use the Course Content table to keep track of the lessons you have completed. The Yoga Selection Advanced Course is the largest and most comprehensive library of advanced Iyengar classes available online. You won’t have to worry about your home practice getting stale or stuck again. Do your practice where and when it suits you, with expert guidance. The Advanced Course ensures you will be supported just as you would be in a yoga studio. The broad range of classes cover key areas of Iyengar yoga at the advanced level. You can complete them in any order you like. Completing as many classes as possible means that you can work in an ongoing way towards a diverse and balanced practice. Focus: This class features the forward bend paschimottanasana. The pose is explored as an end in itself, but is also used as an entry point into the more challenging related poses, urdhva mukha paschimottanasana and parivrtta paschimottanasana. The class will be helpful for improving hamstring flexibility, and the combined forward bend and twisting action will have potential to release your back. If you are newer to these poses then these benefits will also be accessible from some of the preparatory stages that are included for each pose. The class also includes some abdominal strengthening poses that will link back to paschimottanasana via ubhaya padangusthasana. Key Poses: Paschimottanasana, urdhva mukha paschimottanasana, parivrtta paschimottanasana. Equipment: Mat, chair, bolster, 2 blankets, 2 blocks, 2 belts. Focus: This class heads in the direction of backbends but with a particular emphasis on leg alignment, and knee care. Some commonly practiced Iyengar Yoga therapeutic poses are included in the sequence. Classical poses such as Virabhadrasana I and II are adapted to highlight leg work that can then be applied to backbends later in the sequence. The class will also be helpful for people wanting to strengthen their legs generally, and quadriceps specifically. Key Poses: Utkatasana, vrksasana, virabhadrasana I & II, urdhva dhanurasana, dwi pada viparita dandasana. Equipment: Mat, chair, bolster, 2 blankets, 2 blocks, belt. Focus: This class focuses on poses that will help to release tension from your spine. Adaptations and variations are included that will assist you to improve mobility in the spine itself and its associated muscles. This type of practice can help to improve the health of your back and assist with injury prevention. It is also great for relieving stress and helping you to relax. For practitioners of all levels of experience it is important to regularly connect with the many benefits that yoga can offer. This class makes use of a wall to emphasise back releasing twisting movements in many of the poses. In the sequence your yoga mat is positioned length ways against the wall. This configuration opens up many possibilities, but in class situations this is often difficult due to space restrictions. Most people will however be able to easily find a clear wall space to use for a home practice. This class will be well suited to people wanting a therapeutic sequence for the spine, but will also be beneficial for times when you are feeling lower in energy and needing more support in your practice. Focus: This class is the first in our series of longer duration 90 minute classes. This time frame allows sufficient time to fully explore a full range of poses. This particular class focuses on forward bends and twists. Basic forward bending themes are introduced initially in standing poses before being linked and developed in the main seated section of the class. Key forward bends such as janu sirsasana, paschimottanasana, triang mukhaikapada paschimottanasana, and upavista konasana are all included among other poses. Twists such as bharadvajasana and marichyasana III follow on from these poses. The class also includes a full range of inversions to offer a complete and balanced Iyengar Yoga sequence. It will be suited to times in your life when you have some space to focus and engage. This type of longer duration class, in addition to the existing classes in the growing video library gives you more options and flexibility in terms of developing your home yoga practice. Key Poses: Baddha konasana, janu sirsasana, paschimottanasana, ubbaya padangusthasana, krounchasana, parsva upavista konasana. 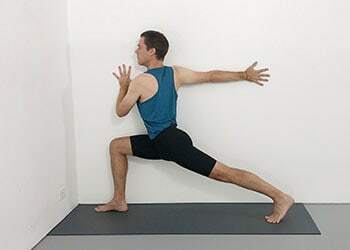 Focus: This class returns to the basic principles of standing poses, and explores fundamental actions and techniques with the support of a wall. Each pose incorporates the wall in a specific way to achieve a desired effect. A wall is often used in Iyengar Yoga to assist balance, increase stability and preserve energy, but it also has potential to facilitate a more energetic penetration of the asana. This class explores a variety of ways in which using a wall can help to deepen your understanding of the standing pose group. Key Poses: Trikonasana, virabhadrasana II, parsvakonasana, ardha chandrasana, parsvottanasana, parivrtta trikonasana, prasarita padottanasana. Focus: In this weeks advanced class we are working on wrists and shoulders from the perspective of backbends. In the early section of the class some challenging variations of adho mukha svanasana are used to help improve wrist mobility. These poses will be helpful in terms bringing about change, and cutting through stiffness. Some adaptations of urdhva mukha svanasana follow. These variations are less about challenging the wrists, and more about how this pose can be adapted so as to take pressure of the wrists. The next section of the class uses chair backbends to focus more on shoulder opening. Urdhva dhanurasana allows you to simultaneously work on shoulders and wrists. Some variations are shown that will be helpful for anyone practicing with restricted mobility in these areas. The class builds eventually towards dwi pada viparita dandasana and chakra bandhasana. All of the poses in this sequence are explored in terms of their impact on shoulders and wrists. Key Poses: Adho mukha svanasana, urdhva mukha svanasana, urdhva dhanurasana, dwi pada vipartia dandasana. Equipment: Mat, chair, bolster, 2 blankets, 3 blocks, belt. Focus: This week our advanced class features yoga poses for strength and resilience. These poses can be a good starting point if you are looking to harness and focus a sense of stability and determination. There can be times when you might have multiple commitments and challenges and might not feel like practicing. When I first started learning yoga my teacher at the time said that the difficult thing is getting on the mat, and then the rest will follow. This simple advice has always been constant for me even when things are in flux or there are new challenges to overcome. New insights come or don’t come on good days and bad days. The poses seem to have their own pace and operate on their own time in an unconditional way. The sequence includes poses that challenge and strengthen on both a physical and mental level. Key Poses: Adho mukha vrksasana, chaturanga dandasana, bakasana, purvottanasana, urdhva dhanurasana. Focus: This weeks advanced class is a companion to the Weekly Intermediate Class 104. It also explores virabhadrasana III but from the perspective of more experienced students. Key actions from the pose are isolated and explored from a variety of positions. The ideas from the intermediate class are extended and put in context with other related standing poses. The sequence also includes inversions such as sirsasana and setu bandha sarvangasana. Although covering similar territory to Intermediate Class 104 this class is intended to challenge experienced practitioners. Equipment: Mat, bolster, 2 blankets, 2 blocks. Focus: This class focuses exclusively on the inversions adho mukha vrksasana, sirsasana and niralamba sarvangasana. The early part of the sequence includes variations of the “bunny hop” handstand. The pose is explored initially with the assistance of bolsters, and then without supports. From there the class works with techniques for free balancing in adho mukha vrksasana. Sirsasana is practiced initially in preparatory stages that improve both strength and flexibility. Eventually a version of the full pose allows you to free balance with a block supporting your upper back. The last section of the class is devoted to niralamba sarvangasana. This particular class uses the support of a wall to assist balance. Some shoulder opening arm variations are included in this pose as well as a back releasing version of karnapidasana. Key Poses: Adho mukha vrksasana, sirsasana, niralamba sarvangasana. Equipment: Mat, 2 bolsters, 2 blankets, belt. Focus: This weeks class follows the breath movements of the diaphragm through various restorative asanas. 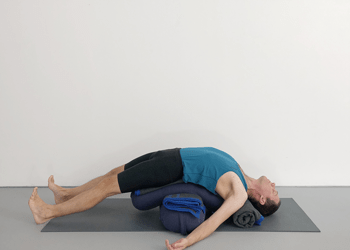 In a number of the poses a bolster is positioned against the front of the torso to heighten the feedback from the diaphragm region during inhalation and exhalation. In this way the sequence uses supported forward bends, in addition to the more traditional chest opening poses such as setu bandha sarvangasana to prepare for pranayama. Awareness of the diaphragm movement is then developed in viloma pranayama with both reclining and sitting positions. Key Poses: Janu sirsasana, triang mukhaikapada paschimottanasana, upavista konasana, pascimottanasana, viloma pranayama. Equipment: Mat, chair, 2 bolsters, 3 blankets. Focus: This class explores supported versions of ustrasana, kapotasana and vrschikasana. These potentially strenuous backbends are adapted so that they can be held for a longer period of time with an emphasis on softening and releasing. Despite a more stationary approach to these poses the sequence as a whole maintains a flowing linear progression. The class begins with some surya namaskar to prepare the body for backbends. From there the basic shape of urdhva mukha svanasana is developed towards ustrasana, and eventually kapotasana. Incremental adjustments to the supports help you to gradually deepen the pose without creating hardness or resistance. This circular development of the backbend action continues toward a version of vrschikasana that uses urdhva dhanurasana as an entry position rather than pincha mayurasana. Key Poses: ustrasana, kapotasana, vrschikasana. Focus: This class explores ujjayi pranayama. In ujjayi pranayama both inhalation and exhalation are consciously deepened and lengthened. In his book "Light on Pranayama" B.K.S. Iyengar methodically presents ujjayi breathing in 13 distinct stages. The first eight of these stages are practiced in this video. Stages one to four introduce fundamental techniques of ujjayi breathing from a reclining position. This helps you explore the basic principles of yogic breathing whilst keeping your body and mind free of tension. Stages five to eight are practiced from an upright seated position. Ujjayi pranayama can help to simultaneously relax the body and nervous system, whilst bringing clarity and focus to the mind. Focus: This weeks advanced class is a longer duration video incorporating standing poses and inversions. The class emphasises classical Iyengar alignment and instruction. The sequence is a comprehensive presentation of the standing asana group. It will be a rigorous, challenging class for experienced students. Sirsasana and sarvangasana are also included with an emphasis on fundamental Iyengar technique. Key Poses: Standing poses, sirsasana, sarvangasana. Focus: This class takes an in-depth look at the reclining kneeling poses supta virasana and paryankasana. Both poses are taught in stages that will make them accessible to a wide range of body types. The knee focus of these poses is then developed towards bhekasana. Eventually a version of niralamba sarvangasana is taught using a chair instead of a wall. This class has a specific knee focus within an otherwise classically balanced Iyengar sequence. Equipment: Mat, chair, bolster, 3 blankets, 2 blocks, belt. Focus: This weeks advanced class runs for 65 minutes. It includes inversions alongside a backbend sequence designed to challenge experienced students. Many of the poses are practiced with multiple repetitions. This gives you the option of gradually taking each pose further at your own pace. Initially, links between ustrasana and kapotasana are explored. From here, Dwi pada viparita dandasana leads you towards eka pada viparita dandasana. Vrschikasana completes the backbend section of the class. You then head towards ardha halasana. 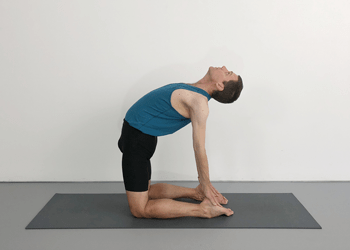 This rigorous backbend sequence will be great for raising energy levels, and expanding your understanding of some of the more advanced backbend variations. Focus: This weeks class links a number of the parivrtta (revolved) twisting poses. The twisting action is developed initially in utthita hasta padangusthasana and then incrementally applied to parivrtta ardha chandrasana. Two different versions of this pose are explored using the support of a wall. Parivrtta parsvakonasana is then introduced using a chair to both assist balance and gain extra leverage into the twist. The full pose is then practiced without support. From there the twisting action of parivrtta upavista konasana is improved with the use of a chair. This class will help to lengthen hamstrings and improve spinal mobility. Focus: This weeks advanced class focuses on the concept of balance. Balance quite literally helps us to position our bodies in space without falling over. This reality check of not falling over is relevant to many of the poses in this class. Initially the class includes the inverted poses from the previous two advanced classes. This allows you to consolidate your free balance in adho mukha vrksasana and pincha mayurasana within a sequence of related balancing poses. From there you focus on balancing on one leg with utthita hasta padangusthasana. The standing balancing poses garudasaa and vrksasana are then linked with ardha chandrasana and virabhdrasana I and III. In the headstand section you work to free balance with the twisting leg variation parivrttaikapada sirsasana. A balancing version of niralamba sarvangasana is included towards the end of the sequence. This class will help to improve your overall sense of balance across s variety of challenging asanas. It will also help to bring a spontaneous stability to both body and mind. Focus: This shorter, 25 minute tutorial style class looks at ways of building more advanced arm clasps into basic seated twists. The class revolves around the poses bharadavajasana, marichyasana III and ardha matsyendrasana. Each of these twists is practiced initially in their more preliminary form, and then with the addition of the arm clasping action. All movements are broken down into stages that progressively build towards a final position. Approaching this trio of poses in this way helps to deepen your experience of the twists, whilst bringing new shoulder opening actions to the poses. Focus: This class is based around paschimottanasana, ubhaya padangusthasana and krounchasana. The asanas are taught in stages that progressively allow the poses to develop, without compromising balance or alignment. Some of the preparatory stages can be consolidated for newer or less flexible students, or used as a point of departure for more experienced students. The sequence will help to improve balance and hamstring flexibility. Focus: The instruction in this sequence of standing poses emphasises fundamental Iyengar teachings. It allows experienced students to consolidate key aspects of technique in a rigorous 55 minute class. Many of the poses are broken down into stages where one particular aspect of the asana is isolated and emphasised. All of the poses are eventually practiced in their final, unassisted state. Although the instruction in this class explores fundamentals and basics, it is intended to challenge students who are familiar with standing poses, and regularly including them in their home practice. Focus: This miscellaneous style class focuses on the wrists, psoas and quadriceps muscles. The first section of the class includes adapted poses that help to strengthen and improve mobility in your wrists. Wrist opening actions are explored in poses like adho mukha svanasana, vasisthasana and parsvottanasana. From there you isolate the psoas and quadriceps muscles in a series of hip opening versions of eka pada rajakapotasana. The class culminates with a supported version of hanumanasana (splits). Focus: This class concentrates on three poses; pincha mayurasana, chatushpadasana and ardha halasana. Preparatory stages are revisited in pincha mayurasana for their ability to strengthen. Priority is given to creating lift through your shoulders. A rolled yoga mat under your elbows in the final pose helps with this. In chatushpadasana various supports and heights are used to maximise lift and opening in the thoracic spine and upper chest. The class then heads towards a version of halasana using a chair, and then finishes with the supported ardha halasana. Focus: This class helps you to improve the mobility of your spine in forward bends. It begins with standing forward bends. A wall is used in this section of the class to help maintain a straight spine, whilst working with hamstring lengthening poses. From there the class heads towards seated forward bends. A chair is used in these poses to maximise the length of your spine, as you introduce twisting actions that encourage an improved range of motion. This approach towards forward bends will be helpful if you are practicing with stiffness in your spine, but will also benefit anyone wanting to improve the general mobility of this region of the body. Focus: This class will help to improve the mobility of your spine. Standing poses are the main emphasis of the sequence. Classical poses are adapted where necessary to help you focus on creating length and rotation. Many of the poses make use of a wall to help you gain better access to your spine. As you work your way through the different back related aspects of the standing poses, your focus will be on on creating space for your spine, and keeping both sides of your torso even in length. This class will be helpful in releasing tension from your back. It will assist you to remove stiffness from your back, and help to bring about improved freedom of movement. Focus: This weeks advanced class contains poses that help to contain your upper back and open your chest. The initial part of the class uses a belt looped around your arms to gain access to the thoracic spine. For many people this is a stiffer region of the back, more prone to lifting and bulging. Poses are chosen that help you to bring a more even balance to this region of your spine. The sequence then heads in the direction of spine releasing chair twists. This is a great class for helping to both boost energy levels and improve the health of your spine. Focus: Poses that help to improve the health of your feet are the focus of this class. The sequence includes poses that help to relieve stiffness and soreness in the arch and heel region of the foot. It also looks at poses that bring mobility to the toes and calf muscles. It might be helpful for assisting with problems such as plantar fasciitis and heel spurs. It will also be well suited to anyone who spends long periods on their feet, or anyone suffering from fallen arches, or anyone interested in improving the way in which they stand on their feet. Focus: This class teaches the arm balancing pose Bakasana (crane pose). It breaks the pose down into preparatory stages that can be beneficial when practiced in isolation, or as part of a step-by-step progression towards the full pose. Initially bakasana is taught from a standing position, and eventually from the inverted pose sirsasana II. There are many benefits that come from regularly practicing Bakasana. It helps to strengthen your wrists, arms and abdominal muscles. It also helps to both open and tone the inner groins, and has a broadening effect on the upper back that can help to release the thoracic spine. In order to feel confident with this pose there is a particular need for persistence and regular practice. As a result, as you progress, it can help to build inner strength and resilience. Focus: This class includes some less commonly practiced miscellaneous poses. Initially the balancing pose vasisthasana is practiced alongside trikonasana and ardha chandrasana. Parighasana is then paired with parivrtta trikonasana and parivrtta parsvakonasana. Parighasana is a great pose for teaching you how to rotate your chest and spine whilst maintaining space in your abdomen, and length through the sides of your torso. These actions will help to improve your standing twists. Sirsasana (headstand) using a "block tower" and chair sarvangasana are also included in the sequence. Some abdominal strengthening poses such as urdhva prasarita padasana close out the class. Focus: Dwi pada viparita dandasana is a backbend with numerous applications in an Iyengar yoga sequence. Supported versions of the pose can be used as an alternative for headstand, or simply as a chest opening restorative pose. Unsupported versions of the pose can be therapeutic for your neck, shoulders and upper back, or act as a transition pose, linking urdhva dhanurasana with a range of other more advanced backbends. Dwi pada viparita dandasana is the sole focus of this weeks advanced class. No additional standing poses or inversions are included. Initially a supported version of the pose is used to create opening. Eventually the more classical unsupported version of the pose is explored. Methods and techniques are added where necessary to enable the backs of your shoulders to lift and your chest to open. Eventually you look at ways of evolving the pose towards other more advanced backbends such as chakra bhandasana. Focus: This weeks class follows a classic sequence of standing poses. You are guided through a comprehensive group of 15 standing asanas. Some poses that involve balance are included, as are strengthening poses, and of course poses that help to improve mobility and stability. For Iyengar practitioners it is important to regularly return to this group of poses to help maintain a healthy and balanced overall practice. This grounding style of class is well suited to times of instability or change. Focus: This weeks class focusses on yoga poses that help to release your gluteals and hip flexors. Tightness in these areas can contribute to poor overall posture, and increase the likelihood of lower back ailments. You might also find that several poses in the class help to improve your quadriceps flexibility. This sequence adapts classical poses such as eka pada rajakapotasana to target these areas. Some spine releasing seated twists conclude this miscellaneous style class. It might be helpful for runners and cyclists, or anyone practicing with tightness in their hips, thighs and glutes. Focus: This class will teach some of the techniques that will help you build towards dropping back into urdhva dhanurasana (wheel pose) from a standing position. Engaging your arm and leg muscles without shortening your spine is a common theme throughout the poses in the sequence. The class runs over 70 minutes long. 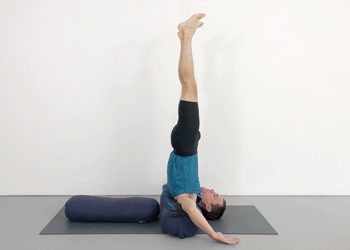 This allows ample time to cover a wide range of backbends and techniques. Chairs, walls and other supports are used where needed to help explore this group of poses. The sequence also includes preparatory stages that will benefit students who may still be consolidating urdhva dhanurasana. More experienced students eventually work to enter this pose by walking their hands up and down a wall. Focus: This weeks class focusses on standing and seated poses that simultaneously lengthen and turn your spine. Although helpful for a broad range of body-types, the class may be especially beneficial for anyone with a mild scoliosis. In most of the poses in the class you are gripping the frame of a chair with your hands. This increases your ability to adjust the position of your spine and ribcage. Emphasis is placed throughout the class on promoting a straight back, whilst minimising any sideways curvature of the spine. The sequence begins with some shoulder opening poses that bring awareness to the alignment of your torso. It then proceeds towards standing and seated forward bends and twists. The class finishes with a supported version of savasana that helps to bring openness and symmetry to your chest. Focus: This hour long class includes sirsasana (headstand) and sarvangasana (shoulderstand) alongside a challenging standing pose sequence. The class explores fundamental Iyengar standing pose techniques. Seven of the main standing asanas are taught in depth, with an emphasis being placed on actions that relate to your feet and legs. Expect that this class will strengthen your legs whilst deepening your understanding of standing pose alignment. Find new layers of understanding with this fresh look at familiar poses. Focus: This class is an ideal re-entry into backbends for 2018. The sequence mainly contains chair backbends. It culminates in a supported variation of the advanced backbend vrschikasana (scorpion pose). The class is an opportunity to reconnect with some of the benefits that can be gained from this group of poses. Backbends are powerful poses that can have a transformative effect on both your body and mind. They can help to bring strength and suppleness to your spine, and assist in improving your overall posture. Traditionally, backbends have been thought of as yoga poses that stimulate the nervous system, and raise energy levels. They can also help to impart a sense of psychological strength and resilience. Focus: Standing poses are ideal poses with which to renew your practice for the new year. This class brings you back to the foundations of standing poses, but from the perspective of an experienced practitioner. Grounding, strengthening and energising; this sequence covers most of the key asanas from the standing group. It is an ideal way to kick start your practice for 2018. Focus: This class focusses on adho mukha vrksasana (handstand) and pincha mayurasana (forearm balance). In addition to the complete classical poses, preparatory positions are also included that will help to strengthen your body and refine your technique. A method for kicking up into a handstand with your feet together in a "bunny hop" action is also explored. Whether you are experienced or newer to these poses, this class gives you an opportunity to delve deeper into these fundamental inversions. Focus: This class balances abdominal strengthening poses with energy preserving forward bends. Headstand and shoulderstand are also featured in the sequence. Forward bends are approached actively. An emphasis is placed on keeping your upper back as straight as possible and your chest as open as possible. This approach is introduced with the standing poses parsvottanasana, then linked with upavista konasana and paschimottanasana. The abdominal section of the class features several versions of paripurna navasana. Both supported and unsupported versions of this abdominal strengthening asana are taught. The latter part of the class focusses on niralamba sarvangasana. This version of sarvangasana can be especially soothing and calming for the nervous system. Focus: This backbend class leads in the direction of eka pada viparita danadasana. The techniques of this famous asana are initially broken down and explored in preparatory poses before being brought together in the full pose at the end of the class. The class has a longer time duration which allows you sufficient time to build up to the pose. The ability to lift into urdhva dhanurasana (wheel pose) is a prerequisite for joining in with this class. The backbend component of the class begins with a series of reclining poses where blocks are used to lift and open the thoracic spine. From there a chair is used to introduce the characteristic leg action of eka pada viparita dandasana. Once you are able to raise your top leg in a supported position, the next stage is to attempt the full pose independently. Focus: This class takes a detailed look at standing poses without including inversions. Most of the 45 minute duration of the class is spent in standing poses. The class will be well suited to times when you are looking for a grounding sequence to strengthen and stabilise. The teaching instruction will help to improve your ability to balance, whilst adjusting and refining. This type of "dynamic" balance is woven throughout a number of the standing poses. You learn to stabilise certain areas of your pose, whilst bringing movement to other areas. This class requires minimal extra equipment or props. Focus: This class contains several chair backbends that are regularly used within the Iyengar Yoga method. Techniques for setting up the poses are explored in detail. Ways of adjusting and aligning yourself whilst in the poses are also explored in detail. In order to prepare your body for working with these poses, you start this class by linking some sun salutes with standing poses. The standing poses that are included share common techniques with backbends. From there you head directly to chair backbends. Initially you work with a version of upward facing dog pose. You then head towards chair backbend variations of urdhva dhanurasana (bridge pose). Some of these poses are great for giving newer students a more supported experience of the pose. They might also be helpful at times when you are lower in energy. More experienced practitioners will also find that they are useful at the beginning of a backbend session where they can help to create opening and space. Focus: In addition to some familiar poses, this class includes some less commonly practiced forward bends and seated poses. Several poses in the class share a common method of gripping your big toe with your fingers. This clasp is emphasised throughout the class. Poses may depend on it in order to maintain balance, chest opening or spinal lift. Don't underestimate the strengthening effect this class will have on your hands and feet. This class will also help to improve flexibility in your hamstrings, adductors and hips. Some of the more advanced poses such as kurmasana, akarna dhanurasana and krounchasana are presented in ways which will help to introduce newer students, whilst challenging more experienced students. Focus: This class follows a classic Iyengar Yoga approach to standing poses. The particular order of the poses in this sequence is commonly used, and is an ideal way to practice standing poses. Most of the asanas from the standing group are included in this class. They range from poses that strengthen, to ones that improve flexibility and balance, to back releasing twists. After standing poses you head towards inversions. This class includes a number of the leg variations that stem from sirsasana (headstand). 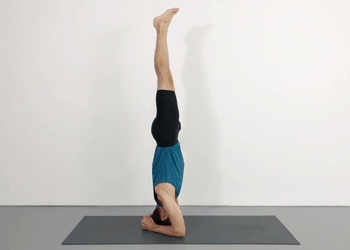 It is necessary to be able to free balance in headstand for a couple of these variations, but the majority of them can be performed with the support of a wall. From headstand you head to a supported chair sarvanagasana and then to savasana. Focus: This 40 minute class is filled with yoga poses to help improve your shoulder mobility. The class concentrates exclusively on shoulders. Classical yoga poses are included alongside adapted yoga therapy poses. The class may be helpful for students who are working with shoulder problems or injuries. It will also benefit anyone wanting to focus on improving their shoulder mobility. It may also be of interest to anyone who would like an insight into the techniques of Iyengar Yoga, and how they relate to shoulders. Focus: This 35 minute class will help to improve the mobility of your shoulders. Some specific shoulder poses are included in the sequence, but in addition to this, adaptations have been made to other classical poses in order to focus on shoulders. You will be guided through adaptations of standing poses such as trikonasana, virabhadrasana I and parsvottanasana enabling you to work on your shoulders whilst still improving your leg strength and flexibility. Some of the adjustments will help you to challenge your shoulders, whilst other adjustments will assist people needing to accomodate shoulder problems. Increasing the mobility of your shoulders will help to not only improve your overall posture, it may also help to develop your full spectrum of yoga poses. Poses such as backbends and twists in particular may start to come more easily as your shoulders progressively open. Focus: This class helps you to work with breath awareness, relaxation and pranayama. The first couple of poses in the sequence help to direct your attention inwards, towards your body and breath. You then lie back over yoga blocks to release your diaphragm, open your chest and bring clarity to your breath. A long savasana then helps you to relax more deeply whilst maintaining awareness of your breath. The pranayama section of the class is practiced solely from a lying, supine position. You start with the more consciously long and deep ujjayi breath, and then head towards viloma pranayama where the breath is drawn in and out in stages. Practicing this sequence before bedtime might assist you in establishing healthy sleep patterns.The class will be helpful any time you are wanting to de-stress and unwind. Focus: This class fits backbends and inversions into a 45 minute sequence. It starts with some warming leg stretches that will help to prepare your body for the backbends that will follow. From there you head to salamba sirsasana (headstand) and work with several of the leg variation that stem from this pose. The backbend component of the class starts with urdhva mukha svanasana (up dog). In this pose you look at ways of linking the lift in your arms to the lift in your chest. 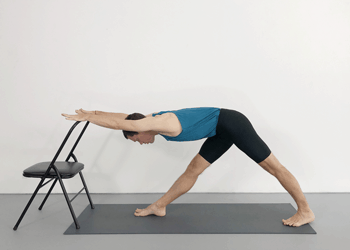 A couple of chair backbends follow where some shoulder opening arm variations are included. Finally you work with urdhva dhanurasana, before releasing your back and cooling down. This class will be well suited to busy times when you are in need of an energy boost. Focus: This class demonstrates some simple ways of giving your knees extra support whilst working with standing poses. The class is categorised as focussing on hamstrings, but in addition to this it will also help to improve general flexibility of your legs and hips. Most of the major standing poses from this level are included in the sequence. Some of the bent leg poses are adjusted so that the ball of your front foot is placed up the wall. This will help to promote a healthy alignment of your legs generally, and knees specifically. Using the wall in this way can help to maintain space and stability within the knee joint. Throughout the class an emphasis is given to ways in which the standing poses can be used to strengthen the muscles associated with the knees. This class will be great for anyone who is needing to take particular care of their knees. It will also suit anyone who is wanting to see traditional standing poses from a new perspective. Focus: This class concentrates on yoga poses that help to improve abdominal strength. No standing poses or inversions are included in this 30 minute sequence. The reclining leg stretches supta padangusthasana are used at the start of the class to prepare your body for the abdominal poses that will follow. From there you are straight into abdominal strengthening poses. Urdhva prasarita padasna is taught initially from a static position with you lying on your back and holding your legs upright. From there the pose develops more dynamically as you raise and lower your legs at 30° and 60° intervals. Paripurna navasana is then practiced in stages of gradually increasing difficulty. The support of a wall is used if necessary. Finally a version of pavana muktasana is used to help strengthen your obliques. Focus: The focus of this class is restorative yoga poses and pranayama. The 60 minute duration of the sequence allows ample time for a range of preparatory chest opening poses at the start of the sequence. These poses help to achieve the required state of relaxation that is necessary for progressing to pranayama. Although intended for experienced students, this class does not include any complicated inversions, and as such will also be suitable for interested students who are newer to pranayama. The first section of this class includes poses such as supta baddha konasana, viparita karani and setu bandha sarvangasana. From there you begin to focus more on your breath. Both ujjayi and viloma pranayamas are practiced in both reclining and seated positions. For this class a chair is used for sitting pranayama as opposed to the more traditional cross leg position. This will be of assistance if you are working with problems associated with your back, hips or knees. This will be a great class for anyone looking to deepen their understanding of basic pranayama, but also will suit people just wanting a sequence to help with relaxation and stress relief. Focus: This class follows a classic backbend sequence. Initially you focus on energising inversions. From there you progress to standing poses that help to open your chest, and bring elasticity to your spine. The backbend section of the class begins with urdhva mukha svanasana (upward facing dog pose). In this pose you will focus on accessing and lifting the central core of the body where the spine is positioned. From there ustrasana (camel pose) is explored in terms of how to best position your pelvis. Finally urdhva dhanurasana (bridge pose) is practiced in stages that gradually bring you deeper into the pose. Focus: Hanumanasana, or monkey pose is an asana that bears some resemblance to the modern gymnastic front splits. The full pose requires considerable flexibility of the hamstrings, quads, groins and hip flexors. Supported versions of the pose can help experienced students with stiffer bodies to improve flexibility in these muscle groups. This 30 minute tutorial style class shows how props can be used to make hanumanasana accessible to most body types. In addition to this pose the class also includes asanas that help to improve overall flexibility in the muscles associated with legs and hips. This will be an ideal class to practice when you are limited with time but wanting to improve flexibility. Focus: This class consists of a classical standing pose sequence that would commonly be practiced in an Iyengar Yoga studio. The class starts with active inversions like adho mukha vrksasana (handstand) and pincha mayurasana (forearm balance). These poses help to build some energetic momentum. From there the class systematically works through standing poses. Links and common threads are woven throughout the standing pose sequence. In headstand you learn how to come in and out of the pose with straight legs. The headstand leg variation urdhva dandasana is then explored in detail. The combined work on both inversions and standing poses will help you to cultivate balance, strength and stability. Focus: This class includes asanas from all of the main groupings of yoga poses. It is an ideal sequence for all-round practice maintenance. Standing poses are used at the beginning of the class to bring movement and energy to your body. From there you head to a couple of forward bends before working with a version of the twisting poses ardha matsyendrasana. Eventually you are guided through some basic backbends before settling into the restorative setu bandha sarvangasana. Most of the main inversions from this level are also included in the class. Expect that this class will help to bring health and balance to all areas of your practice. Focus: This 30 minute class focusses exclusively on arm balances. You are guided through six of these challenging, yet energising poses. Arm balances are strengthening poses on both a physical and mental level. They help to build confidence and impart a sense of lightness to the body. Wrists, arms, chests and abdominal muscles are all toned by these poses. Arm balances require you to support your full body weight with your arms. The class begins with chaturanga and vasisthasana where your feet remain on the floor, and progresses to poses such as tittibhasana and bhujapadasana where your feet are taken completely off the floor. Each of the arm balances in this video are explored in detail with step by step instructions. Preparatory stages are included for the benefit of students who are newer to these poses. Focus: Tittibhasana is an arm balance that shares common ground with forward bends. This class heads in both the direction of arm balances and forward bends. To prepare for the arm balances you are guided through several standing poses where an emphasis is placed on using your arms to support your body weight. From there you work with a set of three arm balances that help to strengthen wrists and develop the arm, chest and abdominal muscles. Tittibhasana and the related pose dwi hasta bhujasana are both explored in detail. The sequence finishes with the challenging forward bend kurmasana. This energising class will help to improve overall body strength and flexibility. Focus: Chair backbends are again the focus of this weeks advanced class. In this class you will be guided through various versions of backbends that lead towards vrschikasana (scorpion Pose). Vrschikasana is an inverted backbend that uses pincha mayurasana (forearm balance) as a starting position. 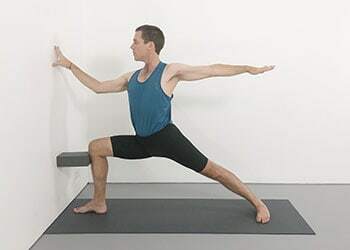 Eventually this pose is practiced free-balancing away from a wall, but here a chair and wall are used to assist you in focussing on key techniques. On the way to vrschikasana the sequence begins with some standing poses linked with surya namaskar. Upward facing dog pose is explored with and without support, and urdhva dhanurasana is practiced lying over the frame of a chair. Practice this class in tandem with its companion class, Weekly advanced Class 24, to expand your repertoire of chair backbends, and consolidate your understanding of this important group of poses. Focus: This 35 minute class will be perfectly suited to times when you are feeling lower in energy, but wanting to keep your home practice momentum moving forwards. This sequence will be great for practicing later in the evening; or after long periods spent on your feet; or at times when you are feeling fatigued, or any time when your legs or back need some release. The sequence begins with leg stretches from a reclining position. Poses that are normally practiced from the floor are taught here with elevated legs and the support of a wall. At no point in the class are you weight bearing on your feet. More classical forward bends are eventually included in the latter part of the class. Expect that this calming class will help to improve the flexibility of your leg muscles, hips and lower back, whilst preserving energy levels. Focus: This class is the second in a series of shorter duration videos focussing on standing poses. You will be guided through a sequence of standing poses in around half an hour. It is a class that will be well suited to busy periods in your life when you are looking to maintain your practice without having a lot of free time. Equally, it can be practiced in addition to other classes when time and energy permits. Most of the key standing poses from this level are included in this class. Like the preceding class in this series, it will help to foster stability, strength and balance. Familiar poses are approached from new angles and perspectives. Although the class does not include inversions, the approach to each pose is geared towards experienced students. Focus: This class begins with a focus on poses that improve flexibility and strength in your shoulders. Standing poses such as parsvottanasana and trikonasana are adapted to emphasise shoulder opening. Vasisthasana is used to help improve shoulder mobility and stability. From there you head in the direction of twisting poses. You are guided through a variety of twists. In addition to standing and seated twists you also work with the twisted inversion parsva sirsasana. The latter part of the class then focusses on chair twists. In addition to freeing up your shoulders, this class will also help to improve flexibility in your thoracic spine, and release tension from your lumbar spine. Focus: Initially this class works with poses that help to release and relax the abdomen and diaphragm region. These positions are commonly relaxing on both a physical and mental level. They make an ideal perspective for watching the breath. Breath awareness is the primary focus in this class. You will be guided in how to observe you breath in supported standing poses, reclining leg stretches, passive chest opening poses and inversions. The latter part of this restorative class is devoted to lying still in savasana, and deepening your breath with ujjayi pranayama. Pranayama is touched on in both lying and sitting positions. This will be a great class for rejuvenation and stress relief. Focus: It is often difficult to remain in challenging backbend poses like dwi pada viparita dandasana for any significant amount of time. Because of this, whilst in the pose you might experience areas of resistance in your body without the feeling of being able to release them. Hurrying these poses can give the sense of stiffness being compounded rather than reduced. 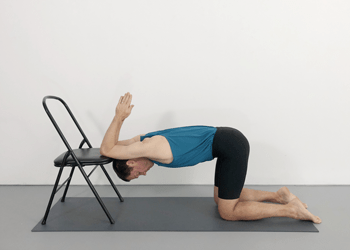 Here is where practicing backbends with a chair can be helpful. The chair offers support in positions that would otherwise require muscular effort and stamina. Rather than creating hardness, the chair holds your body like a frame, allowing you to soften, open and breathe. This approach to backbends enables you to stay longer in poses with more composure. The benefit of the pose has more time to soak into your body, and corrective change is more likely to occur. 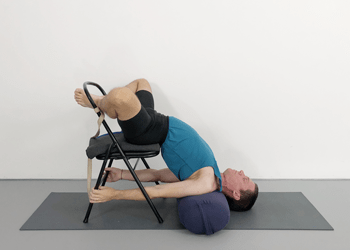 This class guides you through numerous versions of chair backbends culminating in dwi pada viparita dandasana and eka pada viparita dandasana. You will learn techniques that will help to increase mobility in your upper back and shoulders. Clear and detailed instruction is given with the set up for each pose. Focus: Forward bends are often thought of as seated yoga poses. When you are newer to yoga it is often easier to learn techniques for forward bends in a standing position. When standing, you are more able to use your leg strength to support you spine and keep your chest open. This approach is still beneficial when you become more experienced. Standing forward bends help to prepare you physically and mentally for a sequence of seated forward bends. This class includes several such standing forward bends. You are guided through uttanasana, utthita hasta padangusthasana and urdhva prasarita eka padasana. From there you work with a couple of standing poses that utilise forward bend techniques. Eventually you transition to some seated hip opening poses, and then forward bends working from the floor. Focus: This sequence of backbend variations is intended for advanced students who have an established, regular backbend practice. The starting point for the backbends in this class is Urdhva Dhanurasana (bridge pose). The ability to confidently practice this pose is a prerequisite for the more advanced poses that follow. Each of these more advanced backbends are approached in safe and sustainable stages. Supports are used where necessary to help anyone newer to the poses, and more experienced students are given the freedom to go deeper. Ustrasana (camel pose) is developed into Kapotasana where your hands reach back onto a wall. Dwi Pada Viparita Dandasana is practiced in stages with the option of eventually coming to Eka Pada Viparita Dandasana. Vrschikasana (scorpion pose) is learnt with the support of a chair and a wall. Eka Pada Rajakapotasana (pigeon pose) is practiced with a belt to catch your foot and blankets to support your hips. This classic group of backbends are much loved by many yoga practitioners for their energy, strength and beauty. Focus: One of the often overlooked benefits of yoga is the way in which it can improve your sense of balance. The ability to balance in a yoga pose is imperative right from the beginning. Before a pose can be adjusted or improved you need first to be able to balance in that pose. Many of the instructions that you are given as a beginner help you to improve stability and balance. It is important that this focus is not lost as you progress with your yoga practice. This class focusses on the concept of balance through a range of different poses. In poses like handstand and forearm balance you will be challenging yourself to balance away from the support of a wall. 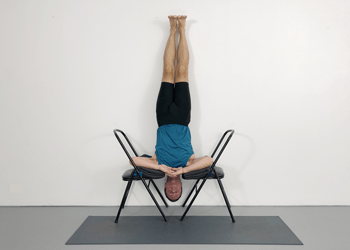 Tips and techniques are shared to help with these inverted poses, as well as other poses where you are balancing on your feet. Balance is explored in poses that are challenging, but also in more naturally stable positions such as dog pose and Sukhasana. You can expect that this class will help to strengthen and stabilise your body, but of equal importance will be its effect in sharpening your mental focus. Focus: This class contains an assortment of poses covering most of the different pose categories. You begin working with poses that open your hips and glutes. From there you focus on some miscellaneous standing poses that are often overlooked in standing pose sequences. Garudasana is a great pose for improving your balance, as well as opening your shoulders. Utkatasana can help to strengthen your knees, and release your lower back. 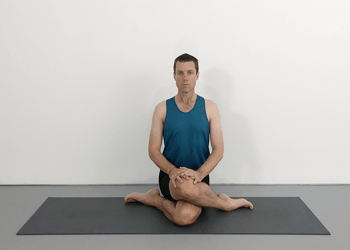 Parighasana is a great link between standing and seated poses. The class then explores Surya Namaskar (sun salutations). You will be moving more dynamically through this section of the class. Standing poses are then linked with the salutes in a flowing sequence of movements. Some calming forward bends are then added to round off a class that explores the full spectrum of yoga poses. Focus: Twists and abdominal poses often get overlooked when putting together a practice sequence. These poses are the main focus of this class. Twists have traditionally been seen as purifying poses. From a yoga perspective they are thought to assist the health of the abdominal organs. The "wringing" action that comes with these poses is thought to penetrate in a cleansing way deep into the body. Twists are also great for releasing stiffness in the back. They can help to improve the mobility and overall functioning of the spine. From twists, this class then focusses on abdominal strengthening poses. Improving your abdominal strength can help to improve your overall posture and balance. This might assist the development of other areas of your yoga practice. Having stronger abdominal muscles can also help to give your spine more support. This class will look at ways of modifying the abdominal pose Paripurna Navasana. This will be especially helpful for anyone working with a sore back or tight hamstrings. Focus: All of the poses included in this class help to remove tension from the body generally, but the diaphragm region specifically. Releasing this area of the body enables you to more effectively observe your breath whilst staying in a yoga pose. This class guides you through a series of poses that have a calming effect on your breath. You begin with some adaptations of familiar poses making sure that your chest is as open as possible. The poses are supported where possible so as to minimise muscular hardness. You eventually head in the direction of pranayama via some restorative reclining poses. This class will have a calming and rejuvenating effect on the breath, mind and body. Focus: A thorough grasp of the four backbends presented in this video allows other more advanced backbends to naturally evolve. All of the fundamental actions used in backbends are contained within these poses. The ability to lift up into Urdhva Dhanurasana (bridge pose) is a pivotal point that gives you access to a wider range of new poses. For this reason it is explored in detail in this class. You are guided through two common methods that assist in raising your head off the floor and straightening your elbows. Anyone not yet able to lift up independently in the pose will be able to consolidate the leg actions of the related pose Chatushpadasana. Urdhva Mukha Svanasana and Ustrasana are also looked at in detail in this class. You will learn ways of using your legs in order to maximise the opening of your upper back and chest. In addition to backbends this class also contains inverted poses such as headstand, forearm balance and handstand. Focus: Paschimottanasana is is a pose from which many other forward bends grow. A thorough understanding of this pose allows other more advanced poses to naturally evolve. For many people it is a particularly challenging pose because of its ability to bring us into direct contact with stiffness in the hamstrings and spine. It doesn't mean that we need to wait for this stiffness to subside before we can practice Paschimottanasana. Stiff bodies are able to approach the pose just as effectively as more flexible bodies. Balancing all the various elements in the pose has priority over how close you come to placing your forehead on your shins. This class highlights all the key elements of Paschimottanasana. You will learn how the feet work; how the action of the legs helps to support the spine; how to maximise the opening in your chest, and minimise the rounding in your upper back. You will be guided through various versions of the pose, some of which will enable more experienced students to get deeper into the pose, and some that will help less flexible students to feel more freedom. Focus: One of the signs of making progress in yoga is the feeling of composure in poses where initially there was struggle. With continual practice it is inevitable that we will start to get glimpses of the elusive "effortless effort". The ability to balance opposing actions enables you to stay in yoga poses without over exerting or pushing. With some of the hardness removed from the pose you gain space to observe more subtle aspects such as the breath. At this point you will probably find that your practice starts to give back more energy than it takes out. Standing poses at their most simple involve the action of pressing down into the floor in order to lift the body weight upwards. When these two actions are in balance a natural lightness comes to the body. In a similar way this class focusses on balancing actions of forwards and backwards; turning the right side in balance with the left side; stability and movement. All of the main standing poses from this level are included in this class. Focus: Shoulders and wrists are the focus of this class. Stiffness in these areas can create difficulties not only within your yoga practice but throughout everyday life. This class comprehensively covers a range of poses which help to improve mobility in these two areas. The shoulders are complex joints capable of a wide range of movement. Because of this an array of poses that approach the shoulders from all possible directions are necessary to bring about change. This class starts with variations of downward facing dog pose that focus on the shoulders and wrists together and in isolation. From there you are guided through some shoulder and wrist friendly adaptations of handstand and forearm balance. The bulk of the class then focusses on specific poses which help to improve mobility in the shoulders and wrists. It will be beneficial to regularly come back to this class and repeat. These poses have the potential to bring about fundamental improvement in terms of mobility, strength and stability. This class contains inverted poses such as headstand (Salamba Sirsasana) and shoulderstand (Salamba Sarvangasana) that will be suited to more experienced students. During the video alternatives to these poses are suggested for anyone not working with these poses. Focus: Arm balances are commonly considered to be among the hardest of yoga poses to penetrate. This tutorial style class demonstrates how this doesn't necessarily need to be the case. You are guided through the four key arm balances; Vasisthasana, Eka Hasta Bhujasana, Dwi Hasta Bhujasana and Lolasana. Each pose is broken down into manageable compartments so that benefits can be obtained without necessarily being able to reach the final stage. Arm balances help to strengthen the whole body but in particular the wrists, arms, chest and abdominal muscles. They are also great for building confidence and resilience. 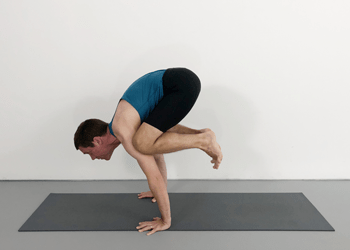 At first glance these poses can seem as if they require huge amounts of strength, but as you become more familiar with them you begin to realise that technique and balance are just as important. Focus: Bridge pose (Urdhva Dhanurasana) is the culmination of this backbend class. You will learn two common methods that assist being able to independently lift into this pose. The first approach using angled blocks will be best suited to anyone working with stiff wrists and shoulders. The second approach reinforces the arms with a belt and will help anyone lacking the upper body strength needed to lift the bodyweight. Whether you are an experienced backbender or newer to this pose, both methods will shed new light on key actions and techniques. In addition to bridge pose this class focusses on camel pose (Ustrasana) and upward facing dog pose (Urdhva Mukkha Svanasana). Both poses are taught over several repetitions, starting with basic actions and then gradually adding points to bring you progressively deeper into the pose. A few standing poses that share common techniques with backbends create some space and chest opening at the start of the class. Thanks so much for the Advanced Course. I can find lots of varied practice guides and sequences which help build on, and consolidate my class work with home practice. We are working on arm-balance/bird poses at the moment. They are challenging poses, but reveal so much.